Telford Borough received a Bucks County Open Space Grant, as well as funding from PA Dept. of Conservation and Natural Resources and Telford Industrial Development Authority, to make the following improvements at Telford Municipal Park on East Church Avenue: new playground equipment, reconfigured ball fields, new basketball courts, new parking lot, additional walking paths, new pavilion and new park seating/benches. The new park opened in July, 2015. 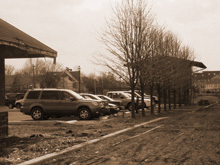 Jacob & Mary Stover Park, located on Fourth Street between Erie Avenue and Crest Avenue, has a baseball field with lights, three tennis courts, a tot lot and parking for approximately 25 cars. Telford Borough acquired this facility through the Montgomery County Open Space Program. 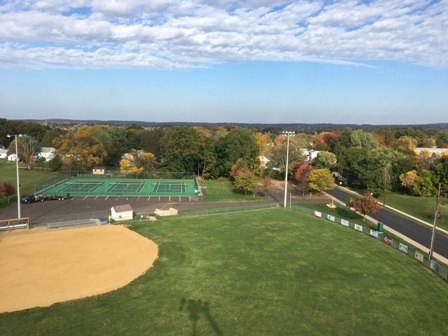 The view above is from a crane 70 feet up in the air as members of the Telford Borough Public Works Crew are hard at work replacing light bulbs at Stover Park on a beautiful fall day. Good job, Guys! Centennial Park, which is located at Third Street and Church Road, has one baseball field, one softball field, one soccer field, a pavilion and available parking. 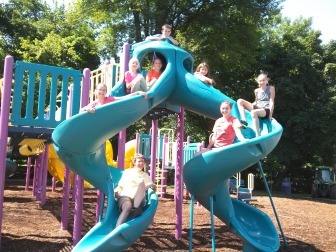 Summit Avenue Playground, located on Summit Avenue between School Lane and Grandview Avenue, has a tot lot, picnic table with pavilion, and on street parking available. The Telford Borough Community Building, located at 125 South Hamilton Street, is the home of the Boy Scout Troop 14 of Telford, and has meeting room facilities and a kitchen(handicap accessible). There is a tot lot located behind the building, and parking is available on the adjacent lot. In 2012, the Borough received a Community Development Block Grant from Bucks County to do improvements to the Community Building, including a renovation of the kitchen, new flagpole, replacement of all windows, and interior/exterior painting, to name a few. The Telford Borough Community Building is available for rent. If you are interested in a particular date, please contact the Borough office at (215) 723-5000 to see if it is available. To download the Community Building rental application, click here. To check out the latest Map showing Parks, Recreation and Culture in the Telford and Souderton Boroughs, click here.